Root Chakra is located near the base of the spine. 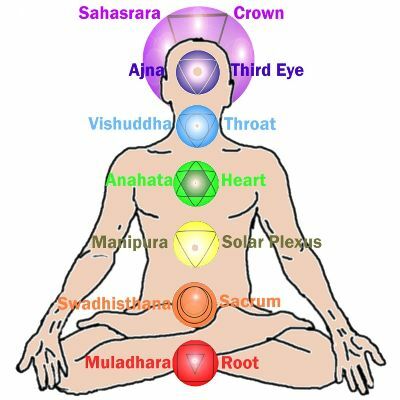 It is considered to be the base or root of all chakras, hence the name. This Chakra rules our physical energy and is associated with our emotional needs for day to day survival instincts. It is related to security, passion, vitality and energy. It regulates the adrenal gland and release of adrenaline hormone, which is associated with ‘fight and flight’ in fear and anxiety. When the Chakra is balanced we feel secure, stable and grounded; under activity makes us fearful and nervous; and over activity results in greed and materialistic outlook towards life. Sacral Chakra is the second chakra and is located near tailbone in the area of navel and lower abdomen. It governs are emotions and feelings, is often associated with sexuality and sensuality. It closely works with reproductive system. At psychological level, it manifests in creativity, sexuality, happiness, self-love, pleasure, ambition, empathy, change, warmth and intimacy. It allows one to enjoy the life, achievements and relationships. When the Sacral Chakra is balanced one is better able to go along with the life’s flow and accept the changes in life; under activity makes one stiff and rigid and over activity makes one extremely emotional. The malfunctioning of this second chakra makes one feel unloved and fall prey to addictions to alcohol, drugs and smoking. Solar Plexus Chakra is the third primary chakra in human energy system. It is located in the lower abdomen below navel and digestive system. This acts a storehouse of energy and is associated with psychological influences of power, will power, dynamic nature, movement, initiative, risk-taking and go-getter attitude. It controls our sense of self-esteem and authority. In terms of endocrine system, it relates to pancreas, digestive system and adrenal cortex (outer part of adrenal glands). Thus the third chakra has an influence on our digestion and metabolism. When it is open, one feels in control of oneself and has sufficient self-esteem; under activity makes one passive and timid; and over activity generates a domineering and aggressive attitude. It is the fourth chakra and is located at the heart. It helps one to take decisions by what we say ‘follow your heart’. It is associated with one’s higher self and does not arise from the unfulfilled emotions or materialistic desires. It guides the emotions such as those of unconditional love, compassion, forgiveness, acceptance of surroundings and a deep sense of peace and harmony with nature. The associated endocrine gland is thymus. When it is open, one feels compassionate, being loved and able to develop harmonious relationships; under activity makes one cold and detached and over activity leads of suffocation of other people by too much love. It is related to negative emotions of bitterness, greed and thoughtlessness. 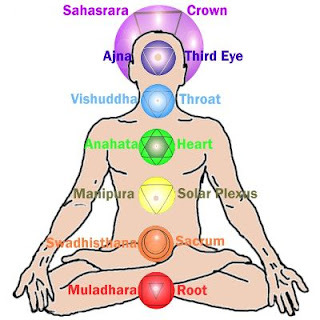 This is the fifth chakra and is located in the neck region, close to the spine. It is also referred to as Purification Centre. It is closely related to the sensory functions of hearing and speaking. In the endocrine system, it is connected to thyroid gland and produces hormone thyroxin which is essential for growth and maturation. It governs communication, creativity and self-expression. It helps one gain clarity between what is wrong and right for oneself thus facilitates formation of our belief system. When it is open, one finds it very easy to express oneself; under activity affect the power of speech and makes on introvert; and over activity manifests as being a bad listener and dominating attitude. A balanced throat chakra increases self-confidence and makes one decisive. This is the sixth chakra and is situated in the brain, directly behind the centre of the forehead. Its activation region is in the eyebrow, at the position of third eye. The energy from this chakra translates into intuition and intellect. The associated sensory organ is the mind. The nature of Ajna Chakra is largely mental and it is related to inner visions, mysticism and clairvoyant abilities. When it is open, individual is able to get a gut feeling of things happening around him; under activity leads to confusion and over activity results in fantasy and hallucination. This is the seventh primary chakra and is also known as ‘Crown Chakra’ because it is located at the top of the head. This symbolizes detachment from illusion and helps one to achieve higher consciousness. In endocrine system, it is linked to pineal and pituitary gland. When balanced and acknowledged it creates a state of ultimate bliss and one transcends from the physical world to integrate with greater self or divine energy. When open, it makes one aware of oneself in relation to the world; under activity results in being completely unaware of spirituality and over activity causes giving up bodily needs. This is majorly responsible for complete harmony of mind-body-soul. The table below describes the key features of each Chakra.